If you need to know more about this for some reason, visit Early Works for explication. 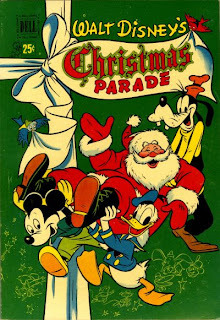 As a good number of you reading this know, Walt Disney's Comics and Stories sold in vast quantities in the '50s, routinely selling in excess of three million copies a month for years on end, without need for gimmick covers, crossovers with Daisy Duck's Diary and Spin and Marty, or some sort of major event in which the Big Bad Wolf rapes and murders Clarabelle Cow, only to himself be killed in revenge by an enraged Horace Horsecollar. 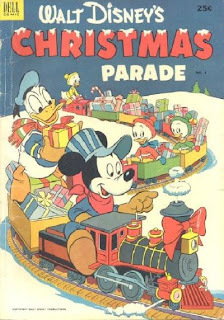 No... the only gimmick they needed was six or eight pages a month by Carl Barks or Paul Murry! 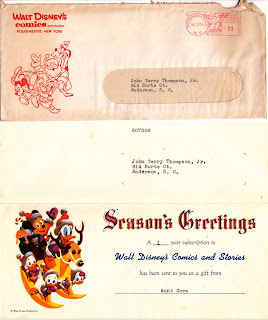 But besides high quality and universally-known characters, one other secret sales weapon was subscriptions, which Dell comics pursued more aggressively than many other publishers. 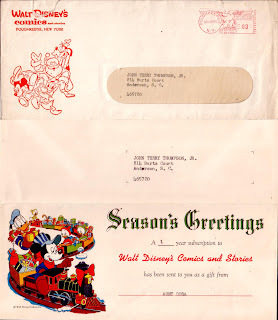 Untold thousands of parents and relatives gave subscriptions as Christmas gifts... including my Great-Aunt Cora, on whose behalf the letters below were sent. My father was eight and nine years old, respectively, when he received these in the mailbox. 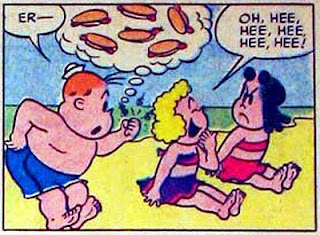 Steve Bissette reports that Irv Tripp, who worked on the vast majority of Little Lulu stories, has died at the age of 88 in Haines City, Florida. 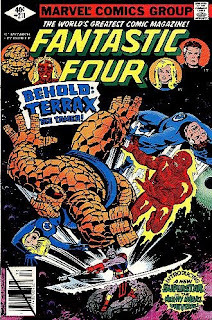 He did finished pencils and inks over rough layouts by John Stanley until 1959, then worked with other writers, notably Arnold Drake, until 1982. Like Stanley, Drake also did his scripts in the form of fairly detailed breakdowns-- I don't know if Tripp's other collaborators worked that way or not, nor can I say for certain if he ever wrote any Lulus himself. 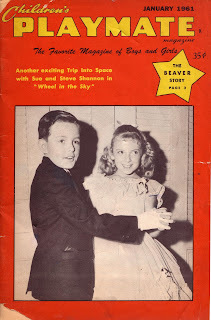 I expect that Frank M.Young will probably have more to say abou Tripp soon at the always great Stanley Stories blog. Here's the local newspaper's obit, and here's Lambiek's Comiclopedia page. Regrettably, he doesn't seem to have ever been interviewed any where I know of, though I'd love it if someone could prove me to be a liar on that count. 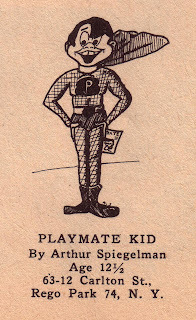 Early Works Crossover Special #1: Little Arthur Spiegelman! 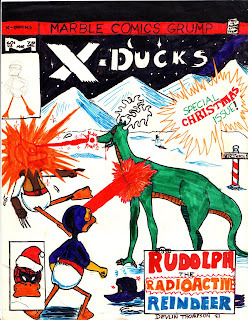 One of my other internet timewasters is Early Works, a blog presenting my artwork between the ages of two and fourteen, with commentary. But I've got skeletons from other closets beside my own... and this is one that I haven't seen in anyone else's blog or fanzine, so it should be a surprise to the vast majority of you. 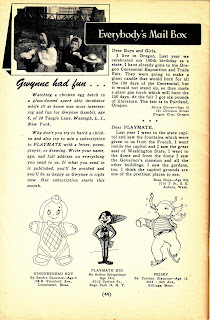 Children's Playmate was a digest-sized kiddy magazine in the same vein as Humpty Dumpty, Children's Digest, and Jack and Jill that dated back at least to the '30s, and lasted until December 2008, as best I can determine (there's not a lot of concrete information about it out there). All the issues I own are from the late '50s-mid-'60s range, and they're all pretty charming, if a bit restrained and cheap-looking. Every issue I've ever seen also looks like it probably seemed about ten years behind the times upon its initial release. 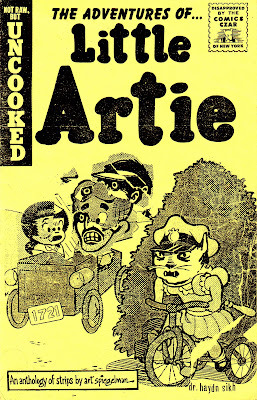 Apart from a lot of (once again, very retrograde) art by Bill Woggon, done in the period between Katy Keene and Millie, The Lovable Monster, there's not a lot of appealing illustration in these to speak to the modern comics fan... that is, except for the January, 1961 issue. Let's take a closer look at that readers' art page, shall we? You can find both of the Spiegelman pieces cited here reprinted, along with a batch of early underground stories (some, but not all of which were since included in the new edition of Breakdowns) in this obscure bootleg collection from several years ago, published by someone purporting to be the reanimated corpse of schlockmeister extraordinaire Myron Fass (even though the real Fass wasn't quite dead yet!). I'm pretty sure I know who "Fass" really was, but I'm no stool pigeon, copper! Good luck locating it, though... I think that there were only maybe 50-60 copies. I heard that one copy got slipped into a display case at a gallery show of Spiegelman's work in Germany, somewhat confusing the patrons. Take A Tour of the Store (and More)! Join noted designer/blogger/author/vertebrate Kirk Demarais on a 2007 tour of the store, along with a view of my home before our stuff all got packed up and shoved in storage awaiting the day when it again has a house to be poured into, right here! 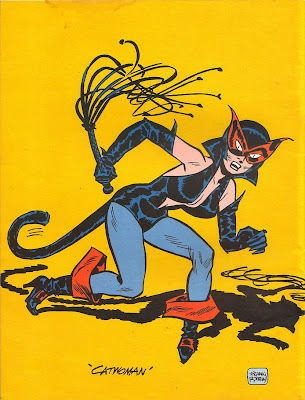 If you were an action-figure-buying child in the mid-'70s like myself, you were probably a bit confused by your Mego Catwoman, wearing an outfit that, while it kinda looked like the TV version, resembled neither her contemporary look nor her appearance in any of the variety of reprints available at the time. I would eventually stumble across back issues with this short-lived outfit, as well as its immediate predecessor, which was even more TV-like, but all green, for whatever reason, but it was only recently that I acquired Amazing World of DC Comics #4, whose back cover features the above image, along with the news that said outfit was in fact a Frank Robbins creation. Incidentally, the Mego Museum tracks the art on the Mego package to a panel in Batman #210, but that panel seems to have itself been closely modeled (read: "swiped") from the design sketch. 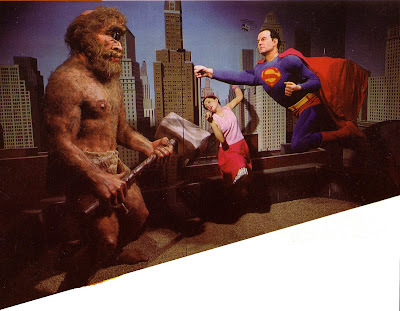 So, was the Mego design department working from the comic, or a stat of this image? We'll probably never know, and I suppose that it doesn't particularly matter. Hey, Rush Limbaugh! Quit crying about Sean Penn and Tim Robbins and the Dixie Chicks! 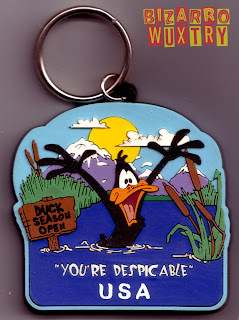 If you want to complain about America-haters in Hollywood, it's time you went after Daffy Duck! Plenty of his Warner co-stars like Blackwater CEO Yosemite Sam and NRA spokesman Elmer Fudd are longtime Republican supporters (I've heard rumors that Fudd was the actual gunman in the old man face-shooting incident, but Cheney covered for him), but let's face it... this guy ain't gonna be a guest blogger at Big Hollywood anytime soon with this attitude! For the record, this is a real, officially sanctioned, fully licensed product, © 1996 Warner Bros. and I haven't fiddled with it at all beyond the watermark. ...and yet here it sits on my desk...a package of First Comics E-Man stickers! feel like the Joe Staton art on the header card is recycled from a subscription ad or somesuch, so it doesn't necessarily imply that there are matching American Flagg!, Jon Sable, Freelance, and...God help us all... WARP sticker sets! On the other hand, those aren't that much less likely. Any of you folks out there in cyberspace ever seen these? I've got to say that, if you're actually an E-Man fan, these are kinda disappointing, with your only actual art featuring the titular hero being tiny reproductions of one cover and a house ad, while Teddy Q gets comparative star treatment. I don't know how these would look to the hypothetical non-fan sticker collector during that era's sticker craze, but maybe an authority in that area will chime in in the comments. 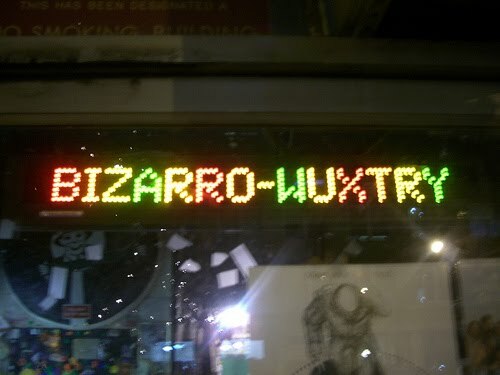 You might possibly interested to know that there is a Flickr group devoted to our establishment under the name The Wonderful World of Bizarro-Wuxtry, which may be examined by clicking the link. You might conceivably have snapshots of the store that you'd like to contribute to said group. I would encourage that line of thinking. Here's a Basil Wolverton piece that I've never seen before, used as part of an ad (the rest was not by Basil, and not all that interesting) in the 8/29/1966 issue of Broadcasting magazine. It was promoting a series of short radio comedy bits by Mel and others syndicated under the name of Superfun. It doesn't look like it lasted that long, but you can listen to the demo sampler album here (Oops! Turns out you have to pay to subscribe...but you can at least look at some more advertising material for free), and you can read a short piece about it in Billboard here. I don't know how this particular job found its way to Wolverton, but it's perhaps not coincidental that both men were from Oregon. If anyone out there knows that they were fishing buddies or anything, please feel free to chime in in the comments. At this point, I should note that here at Bizarro-Wuxtry, home of Georgia's best selection of Sad Sack's Funny Friends, Super-Villain Team-Up,and a great deal more , we have a wide selection of Basil Wolverton products, from comic books to fancy hardbacks to lovely collectible statuettes, offered to you at very reasonable prices. Come on down! Bonus Mel fun: a whole bunch of episodes of The Mel Blanc Show from the '40s, just itching to wiggle their way into your iTunes library. 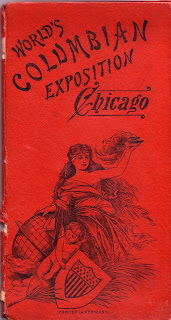 Assuming that you've read Jimmy Corrigan, the Smartest Boy On Earth (and if not, I recommend you do so posthaste), then you naturally recall the section of the book regarding Jimmy's forebears and their adventures at the World's Columbian Exposition of 1893. And if you did in fact read said book, and do therefore recall that portion, then it is perhaps not that much of a stretch to imagine that that you might find today's featured objects of some interest. 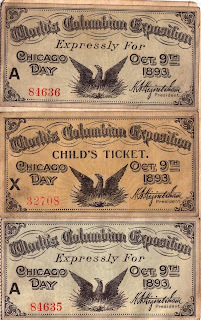 What you see below are a family's tickets to the Exposition on Chicago Day about three weeks prior to its closing. It was a special event commemorating the 22nd anniversary of the great Chicago fire, and was meant both to celebrate the city's recovery and to attempt to break the record for paid attendance at a World's Fair, then held by the Paris Exposition of 1889, of 397,000. At 716,881 (or 761,942, according to one source), it did so handily. I bought these tucked inside the below souvenir folder, which the elder Corrigan probably would not have purchased for his son, because (SPOILER ALERT!!) he wasn't a very good Dad. It's a roughly 3 3/4"X7" hardcover accordion-folded booklet. 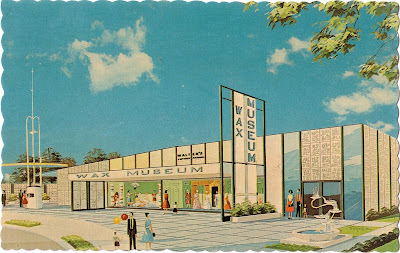 with a twelve-paneled, one-sided assortment of photos of the Exposition, printed on thick coated stock. Here is a page showing some other cool souvenirs that Papa Corrigan also didn't buy for young James. 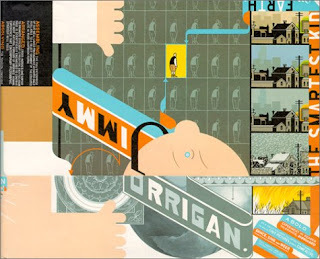 While today's featured items are not themselves available to the consumer (unless you are in fact Chris Ware, in which case I'd love to trade them to you! 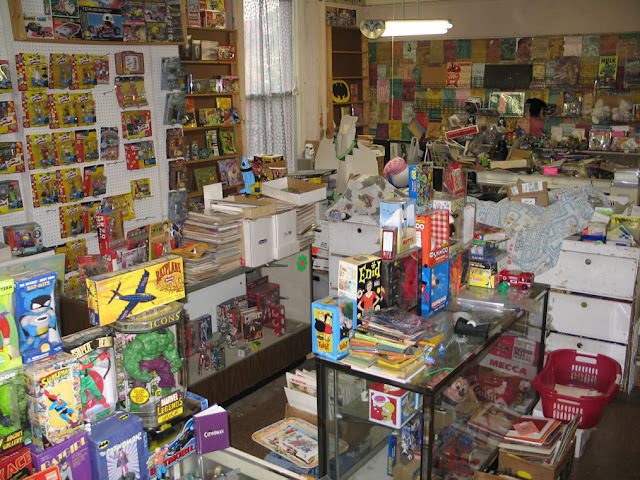 ), we have many delightful Ware products (and thousands more non-Ware products, for you haters in the audience) available to you at Bizarro-Wuxtry, your one-stop shopping location for comic books, vintage Lee Majors biographies, cardboard novelty neckties, and more! Come on down! SENTINELS OF LIBERTY #1- Screaming on the Inside: "THE MURDER, Part One"
It's funny... Terrax is a pretty distinctive personality. You'd think I'd remember him coming in. Of course, we get a fair number of famous people coming through, so maybe he just got lost in the shuffle. Actually, Robert pointed out that he has himself occasionally been a "bearded gentleman behind the corner (sic)", but he also has no memory of this happening. But if you read it on the internet, it must be true, right? Thanks to author Gary Dreslinski for choosing us to demolish. I'm going to assume that it was a friendly "tip of the hat", rather than a sincere display of animus towards us... but either way, it's pretty cool to have made it into the world of "fanfic". I'm just glad it wasn't "slash." 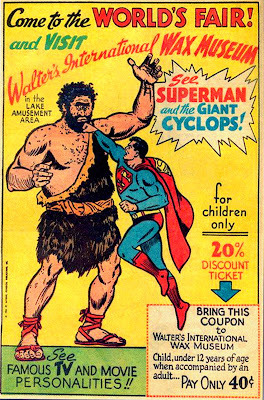 If you're anything like me (and I suspect that you aren't), you're intimately familiar with this ad that ran in all DC books in 1964. I've probably got 8 or 10 copies of it in one comic or another. I wondered for years what exactly was being advertised, but I assumed that I'd never see it. Of course, sometime in the intervening years, they invented the internet, and, more specifically, they invented eBay, and a saved search therein eventually brought me the answer to my quest, though it took nearly a year. Because I am a good and generous man, I'm sparing you my arduous search. It's a bit underwhelming, but the Cyclops himself is pretty swell. I can't help but wonder if he'd been prepared for a mythologically-based display, and then conscripted to fight Supey (like the wax museum in Helen, GA we visited that had a display of a 19th century general store, one of whose occupants was unquestionably Gerald Ford in a new change of clothes). I guess they're shooting for a vaguely George Reeves-ish appearance, though Lois doesn't look like Noel Neill nor Phyllis Coates. Superman's hair seems to be an uncharacteristic texture, but it's hard to say for sure from the photo. 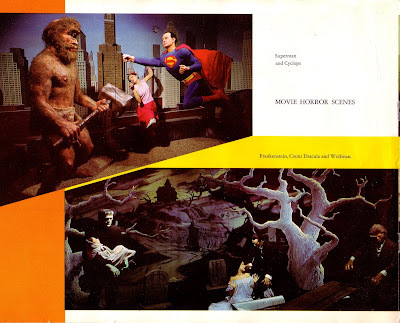 I thought for a moment that maybe they were supposed to resemble the stars of It's A Bird, It's A Plane, It's Superman, but a quick search determined that the musical didn't open until March 1966. By now I've seen the cardboard submarine,the Giant-Size Moon Monster, I own some of the 100 pc.Toy Soldier Set and a Gigantic Frankenstein poster (scroll down a ways), and I finally got the record that Bob Kane co-wrote by Hank Leids and his "Bat-Group" Courage (stay tuned to this blog for that little gem, eventually), so this was my last major comic ad mystery. It's a good thing that I have a near-infinite number of interests, or I'd be kind of bummed out. Still... tomorrow is another day!